Good strategy implies the coherence between objectives and the way people interpret them on each level of the organization. In the business scorecards this coherence is achieved via the cascading process. In this article I’d like to use some examples of cascading to summarize the best practices and typical pitfalls. Cascading was introduced in earlier works about the Balanced Scorecard framework (see books reference below) as a way to populate the scorecard through the organization. Both terms “cascading” and “alignment” refer to the discussion around the strategy and its objectives. This discussion makes it easy for business units to understand their role in strategy execution. Let’s take a simple example to show how strategy alignment (or cascading) works, what principles are important, and where the typical pitfalls are. Any business has a website these days, so for an example, let’s take the discussion around a company’s online presence, customer experience and the company’s website. On the strategy map of CEO, we have a goal Provide customers with better products or services (see the “Customer” perspective on the map). Imagine the marketing team and the CEO are discussing ways to achieve this goal. 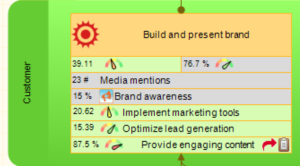 Marketing specialists suggest to Build and present brand online (see the Tier 2 scorecard below) to make sure that customers are aware of the excellent products that the company produces. The connections by the goals is clear: Build and present brand online (from Tier 2) will be supporting Provide customers with better products or services (from Tier 1) on the CEO scorecard. In this case, we can establish a hard connection by indicators. I’ve created an “Imported indicator” for Provide customers with better products or services (learn more about cascading with BSC Designer). This imported indicator is Build and present brand; it is a leading indicator in the context of the Provide customers with better products or services goal (the green color on the strategy map), and its performance (76.7%) is taken from the Marketing scorecard. The arrow on the right tells me that this is an indicator imported from another scorecard. Tier 1 - CEO Scorecard online, sign-up with a free account to unlock all functions. Let’s now have a look at the marketing scorecard. There is a vague goal Build and present brand that needs to be something more specific. In this case, the marketing team has an internal meeting. They are looking for ways to address the Build and present brand goal. Some members of the team (the website team) suggest focusing on the online presence in order to achieve the goal. 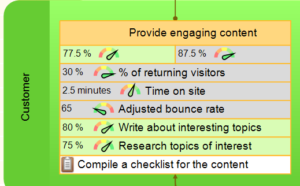 We are building a Tier 3 scorecard (you will find it below) with Provide engaging content goal. This goal is aligned with the Build and present brand goal from Tier 2 (Marketing scorecard). Again, we can link the goals by indicators. I’m switching to the Tier 2 scorecard and creating a new imported indicator for Build and present brand goal. The new imported indicator gets its data from the Provide engaging content goal of the Tier 3 scorecard. 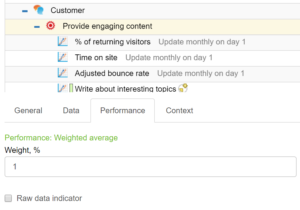 In the context of the Build and present brand goal, the new Provide engaging content indicator is a leading one and will contribute to the leading performance of the goal (39.11 figure on the screenshot above). Tier 2 - Marketing Scorecard online, sign-up with a free account to unlock all functions. Finally, the website team can build their own scorecard and align their goals with the goals of the organization. They can use the strategy map to map additional goals on their level like, for example, Research topics of interest and Write about interesting topics. The performance of the goals is calculated using lagging indicators (the gray lines). 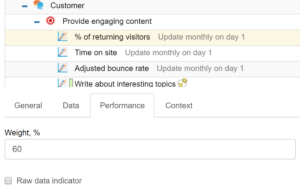 That’s the data that is translated to the Provide engaging content which will end-up on the Tier 2 scorecard. 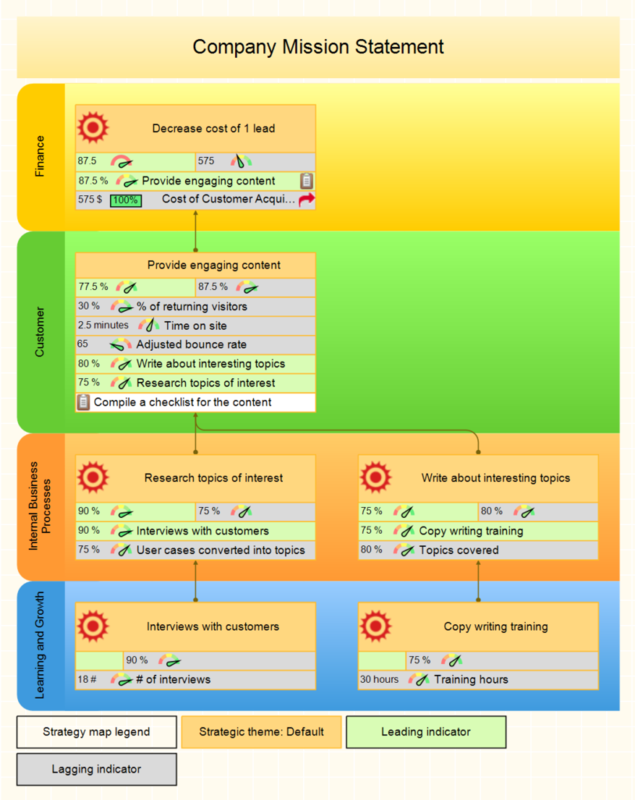 Looking at the strategy map of Tier 3 (a screenshot on the right), you can learn that the lagging performance of Interviews with customers and Copywriting training is translated as a leading performance to the corresponding goals in the Internal perspective. Tier 3 - Website Team Scorecard online, sign-up with a free account to unlock all functions. For now, it looks like the Tier 3 scorecard (the website team) works only to contribute to the Build and present brand (via Provide engaging content goal). That’s probably not a full picture of what’s going on. Let’s get back to the Tier 2 scorecard. By tracking the goals’ logic on the strategy map, we can see that a company has Build and present brand for a reason. This goal helps to achieve a number of goals from Finance, including Control marketing costs. It’s a good idea to translate the Control marketing costs goal down to the Tier 3 level. The website team (tier 3 scorecard) will contribute to this goal indirectly via the Tier 2 marketing scorecard. I’m switching to the Tier 3 scorecard and adding a new imported item to the Decrease cost of 1 lead goal. The indicator Cost of Customer Acquisition (COCA) comes from the Tier 2 scorecard and will be a lagging indicator in the context of Decrease cost of 1 lead goal. I’m going to summarize once again the flow of performance between scorecards. To have a better understanding of what’s going on, I recommend that readers check out this part of the Scorecard 101 article where we talk about the flow of leading and lagging performance on the scorecard. Now, when we have all scorecards ready, let’s move from the Tier 3 scorecard to the Tier 1 scorecard. On the Tier 3 scorecard, we have some goals in the Learning and Growth perspective which contribute to the goals in the Internal perspectives. The goals from the Internal perspective contribute to the leading performance of the Provide engaging content. The resulted lagging performance of the Provide engaging content goal (87.5%) contributes to the Tier 2 scorecard. Among other leading indicators, the imported indicator Provide engaging content contributes to the leading performance of the Build and present brand goal. The leading performance of Build and present brand will not be translated to Tier 1 (not directly). It stays on the level of the Build and present brand goal and helps us to understand that we did what we planned to do. The Build and present brand goal has a number of lagging indicators aligned with it like Brand awareness and Brand awareness. These lagging indicators contribute to the lagging performance of the Build and present brand and will be translated as an index up to the Tier 1 level. Finally, let’s track the logic of Cost of Customer Acquisition (COCA) indicator from Tier 2. On Tier 3, we have the Provide engaging content goal that contributes to the Tier 2 Build and present brand goal. The Build and present brand contributes to the leading performance of the Control marketing costs goal. The Cost of Customer Acquisition (COCA) is a lagging indicator for Control marketing costs. We have imported it from the Tier 2 scorecard to the Decrease cost of 1 lead goal from Tier 1 scorecard. As you can see, the cascading of the financial perspective from Tier 2 to Tier 3 was done formally. One understands that creating engaging content will attract more visitors from search engines and will reduce the cost of customer acquisition, but this is more the reminder of why these objectives are important from the financial point of view than a specific reference to the financial outcomes. The most important thing that we did on each tier is keeping the cause-and-effect connections between objectives. If this isn’t done, the strategy map of the next level will not make sense, and as a result, achieving coherence between business goals and respective actions won’t be possible. An example of the bad strategy alignment is when your marketing team is chasing for an award-winning web design instead of justifying their actions by a/b tests and tangible metrics like time on site, adjusted bounce rate %, etc. With the current strategy map, we can easily follow the logic from top level objectives down to the individual objectives and vice versa. In the “Internal business processes” perspective, we have the objective Research topics of interest. This implies that there will be a business system that will allow keeping an eye on the interesting topics (think about Google Alerts or similar). In the “Learning and growth” perspective, there is the objective Interviews with customers. It’s not about conducting a single interview; it’s more about ongoing communication with the customers. With properly organized discussion around strategy, you will have most of the most important opportunities on the table. Still, there is no guarantee that you’ll take into account everything after the first revision. There are many reasons why executives use business scorecards and cascade them thought the organization. The best practice is to use the Balanced Scorecard approach for strategy alignment as it was described in this article. Also, we often see scorecards that are cascaded to the lower levels for the purpose of the reporting (or even direct control). The idea is that top manager scorecard will aggregate the values from lower level scorecards and present required information for the decision makers. It is important to understand, that in this case executives deal with KPI scorecard, which helps to track operational performance. KPI (operational) and Strategy scorecards can hardly be combined, unless we are talking about business units that copy the parent strategy. This might be the case when an organization distributes its model into the regions, and they are following the strategy without adapting it to the local market. Strategy alignment is achieved by cascading of business goals. Cascading of some KPIs is possible, but reporting is not the purpose of business scorecard cascading. 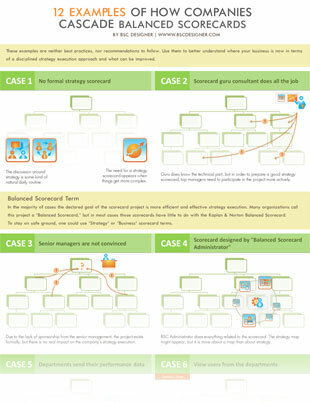 Doing a “hard” part of the cascading doesn’t ensure the acceptance of the scorecard and strategy map idea on all levels. One way to increase your chances for high employee engagement is to make a short presentation focused on strategy. I do suggest to look at Pecha Kucha for this purpose. Does one presentation support another one or does it look like people are talking about different companies? 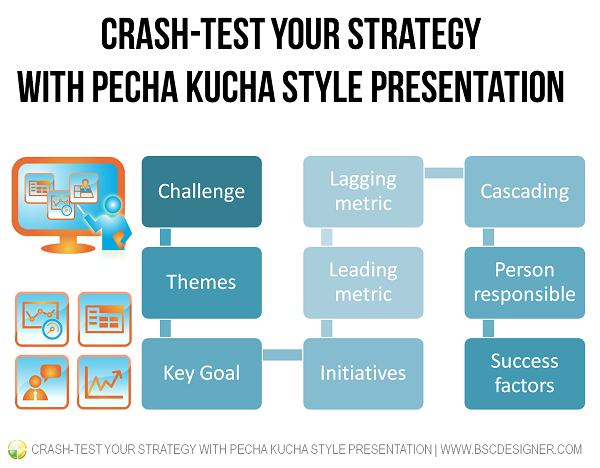 Pecha Kucha is a presentation style that came to us from Japan. You have 20 slides, and each slide is shown for 20 seconds only. This presentation style is known as the killer of boring PowerPoint slides. How many words can you pronounce in 20 seconds? It is a rhetorical question, as it’s not about increasing the speed, it’s about focusing on what matters. During the presentation focus on a few key ideas only. Don’t use text, use pictures. Practice a lot even if you are an experienced presenter. In this case a strategy map is a picture that is worth a thousand words. 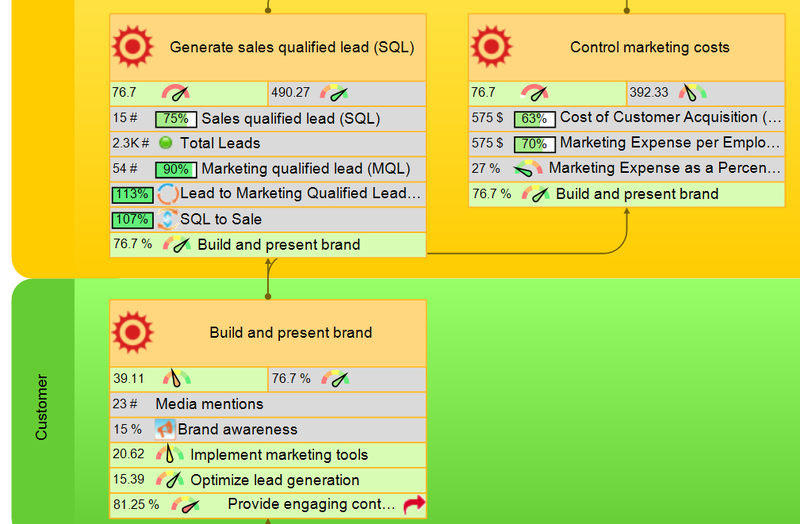 If you have your strategy scorecard project in BSC Designer – you are lucky as you will have a lot of visual materials. Need ideas for your presentation? In your strategy scorecard you have at least 3 strategic themes, that’s a good starting point. Explaining Excel spreadsheet with KPIs in 20 seconds… hmm… it’s a challenge! Reserve a few slides to share your approach to the performance measurement, and be sure to focus on the most important KPIs. Again, users of BSC Designer are lucky to have a lot of visual materials ready. Does one presentation support another one or it looks like people are talking about different companies? That’s a good test for silo-thinking! If you have noticed that people have no idea about how their strategy is related to the strategy of another team, then you know where to focus your leadership efforts on. If you need a template to get started, then check out this one here. Please, note: it’s just an example of what such a presentation might look like, don’t take it as a requirement to fulfill or as a standard to follow. And there are 3 directions that we are going to address in 2016 to move ahead with this. Mention a key goal from strategic theme 1. What are your key initiatives about this business goal? Explain what leading indicator you will monitor to make sure you are on the right track. Explain what lagging indicator you will track to make sure that the result was achieved. How is a previously mentioned goal related to the next big goal? Use your strategy map to show the cause-and-effect connection. Mention a key goal from strategic theme 2. How is a previously mentioned goal related to the previous and/or next big goal? Use your strategy map to show the cause-and-effect connection. Mention a key goal from strategic theme 3. How is a previously mentioned goal related to the previous big goals? Use your strategy map to show the cause-and-effect connection. How is your strategy aligned with the overall company’s strategy? How it is cascaded to the lower levels. Who will be responsible for the execution of your strategy? Mention some names and show headshot photos so that people know who will be in charge. If your timing allows, repeat again what you plan to achieve, why, and what are key success factors. Have you tried this presentation style for presenting a strategy? Feel free to share your experience and your findings! 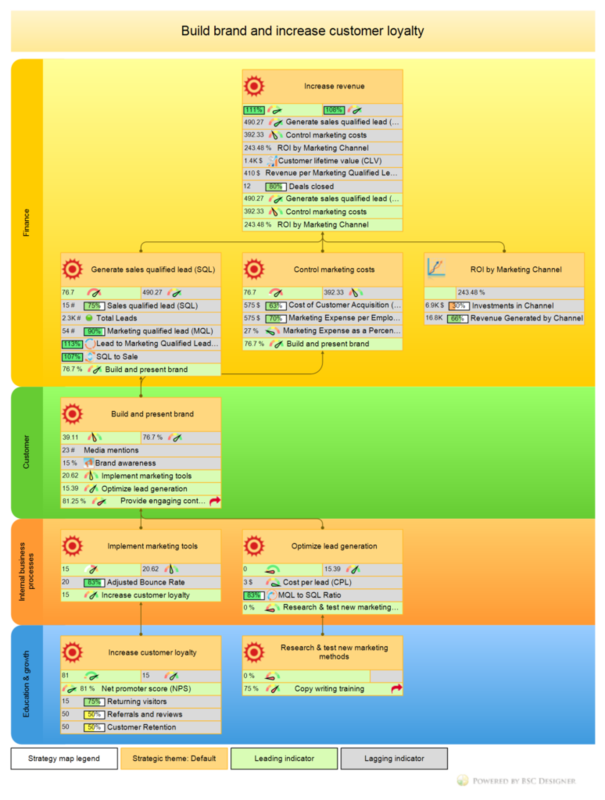 On bscdesigner.com we are trying to engage with customers via surveys and pools, so here are some typical questions that people ask about cascading. Can you share some examples of cascading? Yes, in this article we shared some examples of how companies cascade their scorecards. Does Balanced Scorecard make sense on lower levels? A scorecard can be used at most organizational levels from the corporate level down to departmental level. The important question is “what value had the scorecard at this level – how will it improve performance.” There are many examples of good function-level (HR, finance, etc) scorecards.” Check out the full interview text. Is cascading a kind of delegation? While there are a lot of shared best practices between scorecard cascading and task delegation these are different approaches. The main difference is that strategy cascading takes into account cause-and-effect connection between objectives (between perspectives and tiers). How to cascade goals and quantifiable measures? In this article the cascading of the business goals was explained. Cascading of the measures make sense when lower levels are scaled copies of the parent organization. In this case we are talking mostly about the cascading of KPI scorecard. The right approach is to define business objectives first, and then choose appropriate measures to track their performance. In this case, the business context has a higher importance than KPI. Why scorecards look similar though the organizations are different? The Tier 1 strategy maps actually look similar as they are normally based on one of the three generic strategies. 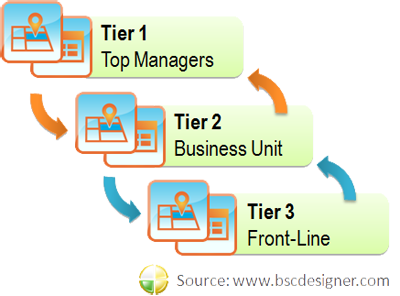 During the cascading and the strategy discussion it appears the Tier 2 and Tier 3 business scorecards are influenced by the company’s team and its experience much more. How to communicate and share the whole strategy? This is done via the cascading process described in this article. The idea is not to send an email with the company’s strategy to the persons involved, but to do a proper discussion about exactly how specific business units will help to achieve the strategy. Well, it will never be interpreted in exactly the same way. Marketing will never have the same perspective as CEO has; CEO will never know all the details about marketing that are important to the strategy. The point is to create a base for the discussion, so that the marketing team would not just do their job, but understand its context. 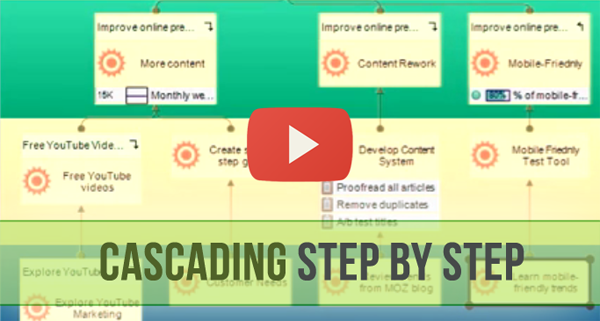 This article explains how one can create this context though the cascading process. To ensure long term performance excellence one need to explain the goals to his team and find the ways to achieve these goals. Any organization in that or another way do a discussion around strategy. Even if strategy is not shared, there is always a chance that line-level will deduce what strategic objectives stands behind his or her job. A leader should compare the risks of supporting “silo thinking” (Silo Thinking: What is the Real Problem and How to Fix It) and the possible benefits of sharing the strategy. As a result, an appropriate form of strategy map with the adequate level of the details can be chosen. 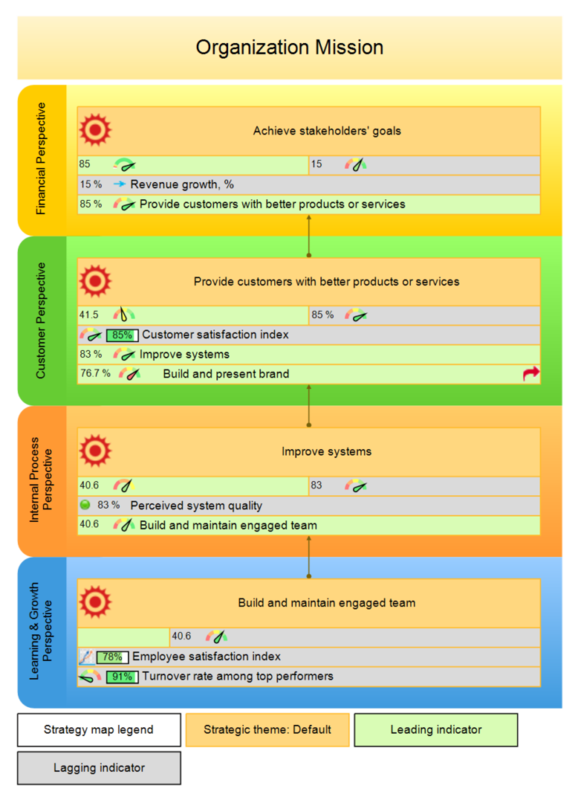 Have you practiced Business Scorecard Cascading/Alignment in your company? Feel free to share your results or general thoughts in the comments. Tier 2 - Marketing Scorecard discussed in this article as a starting template for your own scorecard! Sign-up with a free account to unlock all functions of the software. Learn how to copy template scorecard to your account. Why Does One Need to Stop Searching for BSC Designer Illegal Serial Codes?